Indian government allocates just 1.1% in budget for health. This rate is well and truly dismal compared to other countries around the world. 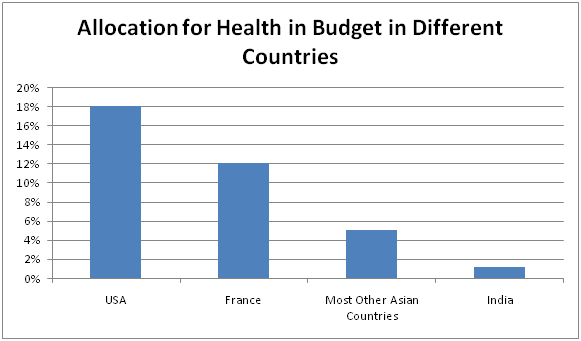 Not only the developed countries like The US, France that allocate 18% and 12% respectively but even most Asian nations also spend about 5% on health. In the January of 2016, Karnataka state government has imposed an 8% luxury tax on every ICU bed that costs over Rs 1,000 per room per day under the Karnataka Tax on Luxuries Act, 1979. The charge for admitting in a private hospital ICU in Karnataka ranges between Rs 2,500 and over Rs 5,000. So, the expenses on daily basis would increase by Rs 200 to Rs 400 for patients and their families. Now, people of Karnataka are going through this misery; rest of India might face the same ordeal in near future. Medical expenses are already extremely high in India and with such directives it will soon go beyond the affordability of common people. A comprehensive health insurance policy is the best way to cope up with this rising cost. Owing to the various means of advertising, you are now quite familiar with the reputed health insurers operating in India. But your mind gets clouded with confusion when you come across a diaspora of health insurance policies at once. To help you cherry pick one, Here are some simple steps to help you decide on the right health insurance plan. In India, more than 25 general insurance companies offer health insurance plans. All these companies are not equal in terms of services provided to policyholders. So, you should take time to check out the overall standard of these health insurance providers in terms of various parameters such as management, background,claim settlement ratio and claim process instead of jumping on a health policy in haste. It is always better to select a provider that operates only in health insurance orbit such as Star Health, Religare and Apollo Munich. While buying a health cover you have to select the right category. The selection of correct type of health policy depends largely on your marital status. In case you are single, an individual health policy will suffice your needs. If you are a married person with children, your best bet is a family floater health policy which offers coverage to your spouse, kids and yourself. In case you are looking for a health plan for your parents who are over 60 years of age you should ideally go for a senior citizen health insurance plan. Sum insured amount should be determined by the city of residence of the policyholders and chosen type of health plan. If you reside in in Tier-1 cities such as Mumbai, Chennai and Kolkata you should opt for higher sum insured amount like Rs 10 lakh for a family floater plan. A family health insurance plan of Rs 5 lakh will be sufficient if you live in a Tier-2 city. Your focus should neither be on the cheapest health policy nor on a high-end health cover with an array of unnecessary features. You should be eyeing on a health plan that caters to your need within your budget. Expensive health plans, more often than not, come up with benefits like wellness benefits, vaccination cover that you don't need. Very cheap plans, on the other hand, may fall short of covering your basic needs. A health policy in the mid-range with wide coverage should be your best bet. As per IRDAI, total cashless claim settlement is just half of the total reimbursement claim settlements for same disease. This means cashless claim settlement is not easily available in India. Therefore, you have to keep a close eye on the hospital network of all the major health insurance providers to locate the insurer with maximum number of hospitals with cashless facility. The reimbursement method of settling claims can influence the standard of treatment one chooses. Because of limited fund, one may not be able to avail best possible treatments upfront. Cashless facility also saves one from the pain of arranging and submitting all the documents and follow up for reimbursement. Sub-limit is a newly introduced clause that you should steer clear of. Typically sub-limits are applied on doctor’s fees, room rent, diagnostics. If you avail a health plan of Rs. 3 Lakhs sum insured there might be sub-limit on room rent of 1% - 2% of the total sum insured which comes down to Rs 3,000 per day, If the room rent is Rs. 4000 per day you have to pay Rs. 1000 from your own pocket. Hence, you should do some research and trace out health plans without any sub-limit. Some health insurance policies in India compel policyholders to pay a percentage of the medical bill. The percentage is fixed for a particular health plan and is pre-defined in policy document. Usually, most plans impose 10% to 20% co-payment on insured people. You should try to find a health policy without co-payment so that you don't have to pay anything at the time of claim settlement. The above list of best 5 individual health insurance plan is made from the perspective of a 30 years old male residing in Kolkata. The chosen sum insured and tenure are Rs. 5 Lakh and 1 year respectively. Many health insurance policies come with a maximum renewal age. It varies from one plan to another and usually hovers between 70 and 80 years. However, the chance of falling sick increases in advanced age. Since medical costs are higher for elderly people it is important to have a health cover. So, you should locate a health plan with lifetime renewal feature. Different health plans follow different ways of covering pre and post hospitalization expenses. Most health plans cover pre-hospitalization expenses for 60 days and post-hospitalization expenses for 90 days. Your focus should be on finding a health plan with maximum coverage for pre and post-hospitalization expenses. Apart from the sub-limits for specific medical expenses, health insurance plans also impose restrictions on days. In simple words, certain expenses like hospitalization, daycare treatments are covered only after a pre-defined period of time. You need to do some research to trace out policies with least waiting period to cover treatment expenses. Most health insurers in India offer no claim bonus if you renew the policy with same provider without making any claim in the previous policy year. This type of bonuses are provided in two different ways. Some health plans increase sum insured amount on renewal every year, while other health policies reduce the premium. You ought to choose the plan that increases the sum insured since healthcare costs are on the rise with each passing year. 37% urban people and 47% rural nationals in India either sell assets or borrow money to pay for medical bills. Healthcare cost is one common reason behind rural bankruptcy in India. Budget 2011 hammered the final nail in the coffin by imposing a 5% service tax on healthcare. No respite for a patient that sells his assets to arrange for a Rs 1 lakh medical bill as he has to manage another Rs 5,000 to pay the tax. This skyrocketing expense of healthcare triggers the need of a comprehensive health insurance plan. It enables you to afford improved treatment facilities for yourself and your loved ones. Hopefully, the steps mentioned above will help you shortlist best health insurance policies as per your requirements and budget. 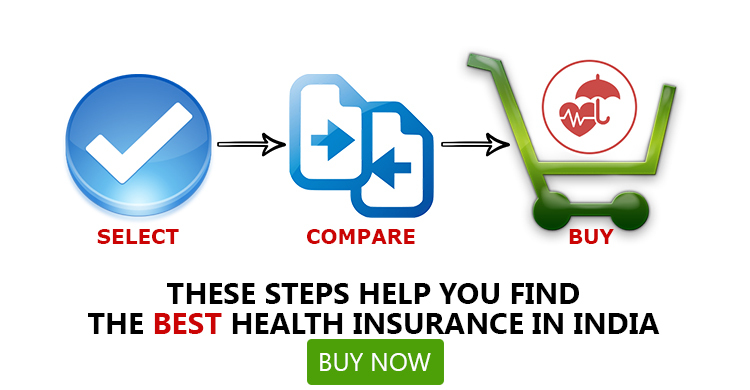 At GIBL.IN you can compare top health insurance plans in just 2 minutes and buy the best health insurance plan online.